Photo Courtesy of Bambi's Instagram. I apologize to all of my readers, I have truly failed you in the gossip department. 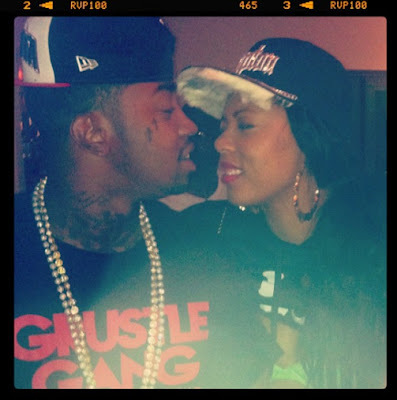 Remember this post where we discussed Lil' "Bleeding Gums" Scrappy and Basketball Wives L.A. star Bambi hooking up back in May of 2011? Well, what I failed to uncover is the fact that Scrappy and Bambi "Chiclet Teef" are still "close" according to Bambi's Instagram. The picture above was posted on Bambi's Instagram last month. I reached out to Bambi and she stated that she and Scrappy are just friends. I want to believe her but wasn't Scrappy playing the friendship card with Shay Buckee Johnson and blowing her back out at the same damn time? They are sitting mighty close in that picture. But if something were going down between the two of them do you think Bambi would be dumb enough to put all her bizni-iz-ness online? Oh wait a minute, who am I kidding? These birds love to be messy! Erica, come get your "fiance"! Maybe Mama DEEpends Diaper Booty was on to something when she doubted whether or not Erica and Scrappy would even make it down the aisle. We will have to wait around and see how this story unfolds. 8/26 *UPDATE* Well, I was right. Bambi and Lil Scrappy were bumping gums this entire time. Check out my updated post with pictures of the couple plus a special message that Bambi left me on Twitter! What do you think about Bambi and Scrappy's "friendship"? Chiclet teef? I'm so weak! Yup! She has little baby teef! I bet Scrappy bought her gifts...LMAO!